The Indian Independence Act was officially signed into law at the behest of British prime minister Clement Attlee on August 15, 1947. The legislation ended more than 250 years of British colonial rule in the Indian subcontinent. The British Raj left a divided continent in its wake. Under the stewardship of Lord Louis Mountbatten, the Empire’s colony was divided into two dominions – India and Pakistan. India remained a dominion of the royal crown until 1950 when the country’s constitution was adopted. Pakistan would follow suit a few years later. However, the partition resulted in bloody conflicts for decades. The Indian Independence Movement involved many disparate groups fighting for the similar aim of ousting the British Emperor of India. Mahatma Gandhi with his rounded spectacles and loincloth shawls is the iconic figure associated with the movement in the west. His civil disobedience forced the British into submission and introduced the world to a new form of non-violent protest. In the decades leading to independence, hundreds of thousands, if not millions, of other Indians took part in violent and non-violent demonstrations across the subcontinent. Madhu and Manohar Varadkar were among the many Indians who stood up to the British Empire during the country’s long-fought struggle for freedom. The two men, who are uncles of Taoiseach Leo Varadkar, both spent up to a year each in prison for their trouble after they were arrested for protesting against the crown. A new biography, Leo Varadkar – A Very Modern Taoiseach, by this reporter and fellow author Niall O’Connor, gives an insight into the Taoiseach’s family background. Madhu, the eldest brother of Leo’s father Ashok, trained as a barrister and during his university years was involved in the Indian independence movement. Manohar, the second eldest of the Varadkar siblings, studied science in university before joining the revolution. In the first biography of the Taoiseach, it is revealed how proud the Varadkar family is of the role the two brothers played in India’s fight for freedom. After independence, both men were decorated for their efforts during the uprising. Their sister, Prabha, also played a role in the independence movement and marched in demonstrations against Portuguese colonialism in Goa. In recent weeks, the Taoiseach has been criticised for the approach he has taken to Brexit negotiations. He has taken an aggressive and nationalistic line with the UK government which would certainly impress his uncles and aunt. Varadkar admits that British/Irish relations have become strained since the UK voted to leave the EU. In commentary on the protracted exit talks, Varadkar has evoked Ireland’s own fight for freedom from British rule. He talked about how we were “forced to accept partition” 100 years ago and warned we cannot go back to the hard borders of the Troubles. He has made moves to build bridges with the unionist community in the North, but this was after he sparked a bitter war of words with the Democratic Unionist Party (DUP) when he was appointed as Taoiseach. He has been accused by the DUP of using inflammatory language during talks aimed at restoring the Northern Assembly. Meanwhile, the Taoiseach’s relationship with Sinn Fein is not only causing concern in the DUP but also in his own party, Fine Gael. Since his appointment, there has been an overt softening in Fine Gael’s approach to Sinn Fein as the prospect of a post-election relationship becomes a tangible reality. However, the Taoiseach will be faced with a long line of resignations if he does take such an approach. It seems it has been left to Minister for Justice Charlie Flanagan to lead the Fine Gael charge against a coalition with Sinn Fein. Many others in the party feel the same. Brexit negotiations have resulted in some bizarre commentary from British politicians and commentators. The Taoiseach has been accused of taking a tough stance on the border because he is keeping one eye on Sinn Fein ahead of the election. This is one part true, one part nonsense. Of course he is keeping any eye on Sinn Fein’s political progress – they are the third biggest party in the country and we are in a perpetual general election cycle thanks to the makeup of the Dail. His stance and rhetoric on the border is not a domestic political issue. No one on this island should want a return of the border and all the baggage that would come with it. All this had led Fianna Fail leader Micheal Martin to accuse the Taoiseach of “bashing the Brits” for electoral gains. 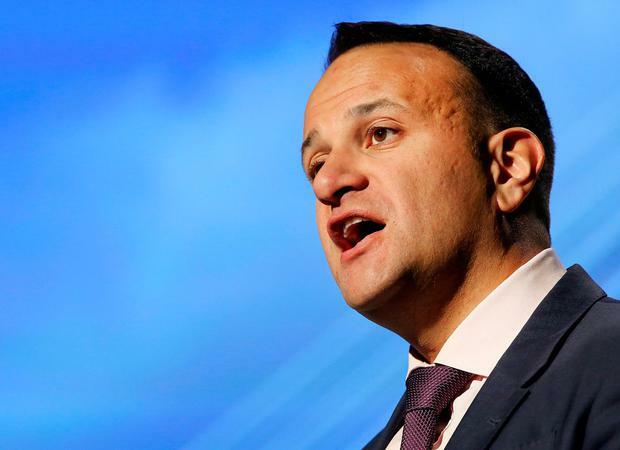 Varadkar did get an opinion poll bounce last December after his showdown with Prime Minister Theresa May in the first round of Brexit negotiations. And, as Martin suggests, perhaps he is trying to maintain these poll ratings. The Taoiseach’s posturing on Brexit has certainly got under the noses of hardline Brexiteers. We laugh off Jacob Rees-Mogg and editorials in The Sun newspaper excoriating the “gobby Irish PM”. But they are speaking to a base in the UK who feel the same. They are speaking to millions of British people who voted for Brexit and want to see it happen. They may be leaving the EU but they will continue to be our nearest neighbours. And it is always in your best interests to get on with your neighbours – in any scenario. Varadkar’s uncles would presumably be supportive of his stance on the much depleted modern day British Empire. He is facing down the crown like they did all those decades ago. But it remains to be seen if Varadkar will be equally decorated and celebrated for his efforts or whether his stance causes irreparable damage to Anglo/Irish relations.